After the 6/30/08 broadcast of WWE Monday Night Raw, which I thought was one of the weakest in a long time, I started thinking about how someone would measure how good or bad they thought a particular wrestling program was on any given week. Raw was the least liked (by me) of any in recent memory, but was it the worst so far this year? Sure, for any given show you can say “I loved it”, “I liked it”, “Didn’t like it”, or “Hated it”. You could say, “It wasn’t as good as last week”, or “It was better than the one last week”. But was it better or worse than the one two weeks ago? And by how much? How much more do you like TNA vs. Smackdown? Is there any way to measure them and do a comparison? I think I mentioned before that I have a TiVo, and that I don’t watch any wrestling programming “live” (or any TV for that matter). Most people’s first reaction to that is, “Oh, because you want to skip commercials”. But it’s actually more general than that. I have home improvement shows I record that I might only care about one particular featured project they are doing. There is a cable access local news channel I watch (Channel 12) that I may only care about certain stories. The ones I care less about I fast forward through at a higher speed (2x, 20x, or 60x). The less I’m interested in it, the higher the speed I fast forward through it. The stuff I really care about I watch at normal “real-time” speed. For wrestling, the same thing applies. If there is an interview or a match I don’t care about, I zip through it fairly quickly (20x speed). If there’s a match that I have only a limited interest in (maybe the outcome or a few high spots), I may watch it slightly sped up (2x speed). If I’m really into it, I’ll watch it at normal speed. Taking this into account, it seems like the amount of time it takes me to watch a program would be a measure of how much I liked it. Not counting commercials, a 2 hour program would take me about 90 minutes to watch if I liked everything and watched it at normal speed. If one week it took me 75 minutes to watch it and another week it took me only 45 minutes, it seems like it would be pretty easy to tell which one I liked better, and even how much better. If one of those weeks was 6 months ago and I can’t remember anything about the program, I would still be able to tell whether or not I liked it better. Or looking at a trend over time whether a program like Raw is getting more interesting, less interesting, or about the same. Again, this would be just in my opinion. This doesn’t necessarily reflect the ratings, or how any other fan feels about the programming. Another measure I thought of after watching this week’s July 7th Raw was to keep track of how long a viewer has to wait from the start of the program until the first wrestling match. It was a looong time on Monday. OK, this whole thing may be a little geeky (most likely it is a LOT geeky), and I don’t know how many people will be interested in it, but I thought if I was going to do something for my own curiosity, I might as well make it public. Starting this week, with this post, I’m going to be providing a weekly update and comparison of Monday Night RAW, ECW, TNA, and Smackdown based on my data. I’m planning to do it for at least a few months. I mentioned before that I haven’t been watching Smackdown for quite awhile. There were a few reasons why I haven’t. The two biggest reasons were that I couldn’t stand listening to JBL (I might have actually said the announce team before, but it’s actually just JBL), and that one more wrestling program a week was just too much, even for me. If I had to drop one, I’d drop Smackdown. But since JBL returned to active wrestling, and the WWE draft a few weeks ago put Jim Ross as the play-by-play man on the Smackdown show with Mick Foley, and because I wanted to see how Smackdown measured up to the other programs, I’ve decided to start watching it again at least for as long as I do this experiment. As you can see here, Raw continues its tradition of filling the opening, and in this case almost the first half hour, with interviews and other non in-ring activity. TNA’s 2 minutes may be unusually short, but we’ll have to see. Here is the total viewing time for each program this week. Looks like TNA is the “most liked” by me this week, with Smackdown being the least. 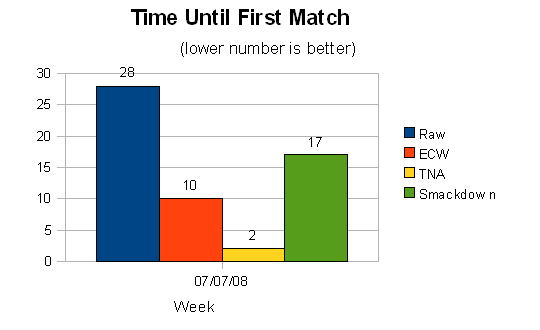 ECW has a slight edge on RAW, but given that it has been scaled by 2 (i.e. 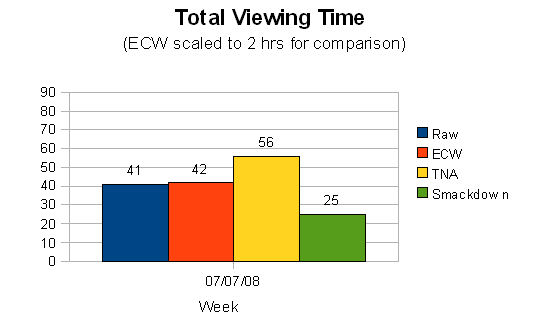 I only spent 21 minutes watching ECW)* it means they are pretty much the same. RAW’s 28-minutes before the first match hurt it I’m sure. I like the concept (though I’m a data geek.) I’m not sure how well two graphs of 4 bars each will scale over multiple weeks (8 data points / week) but I guess we’ll all find out. Also, 28 minutes before the first match? That’s ridiculous. I’m not sure yet how well this will work either. I think the bar charts will just be used for showing the current week. I’ll need to use a line chart or something else to show the week to week changes. I dvr wrestling and FF through a lot as well. Too bad I can’t set my dvr to start recording RAW at 8:30 so I don’t have to FF through all that crap.